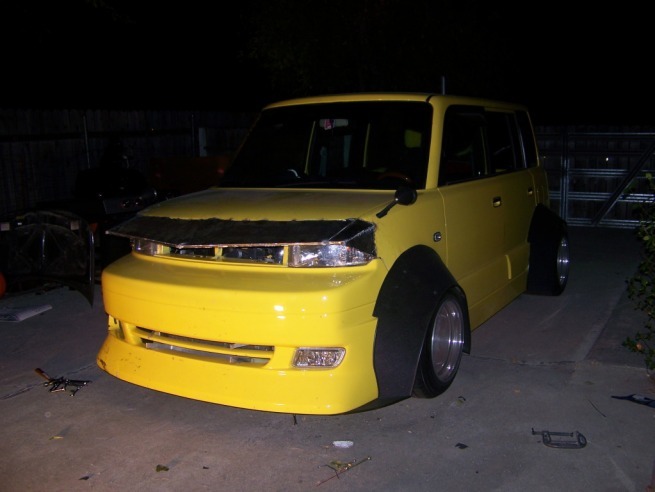 I’ve seen this Scion a few times in my travels in the interweb. The man behind OMG Pancakes is a big fan of this car and I get most of updates regarding it from there. 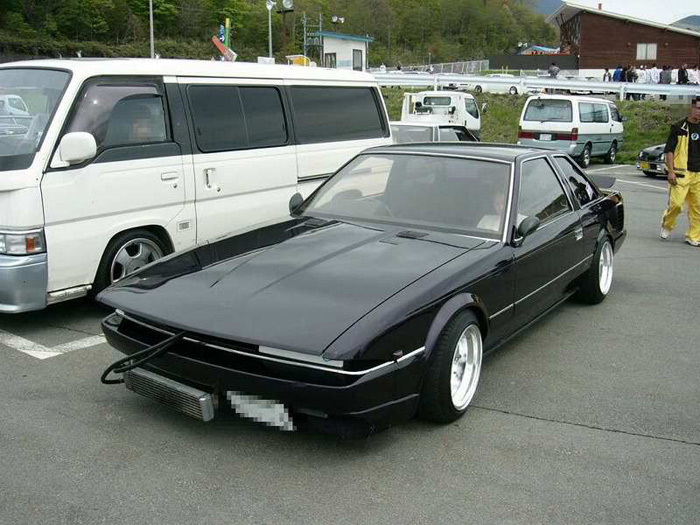 The Bosozoku style is a fairly rare in North America so it’s interesting to see someone with enough guts to try and tackle it but it raises the questions are we ready for this style to come here and do we even need it? The Boso style came from Japan which is host to a bunch of other strange and crazy things so over there Boso cars are probably not really that strange but here the are a different story all together. They really are strange and stand out quite prominently making a statement about the owners individuality. 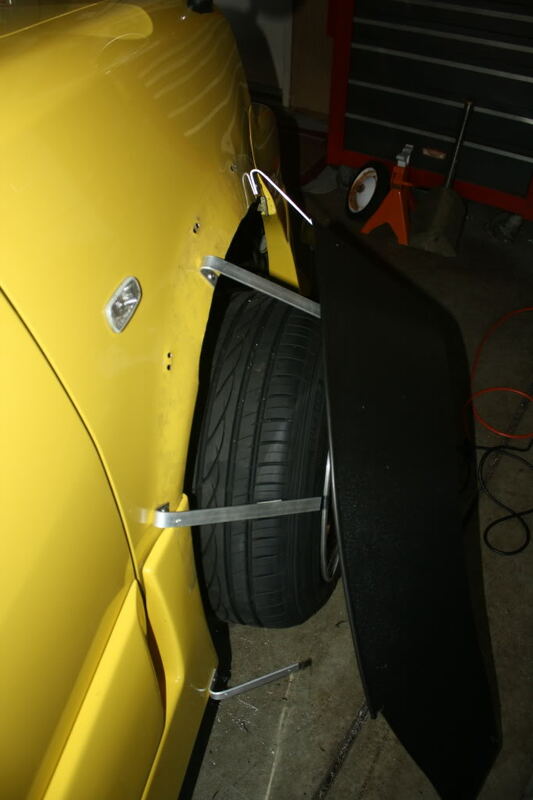 As we all know the nail that sticks out gets hammered down and as such the Boso Box has been met with criticism on various automotive forums all over the internet. 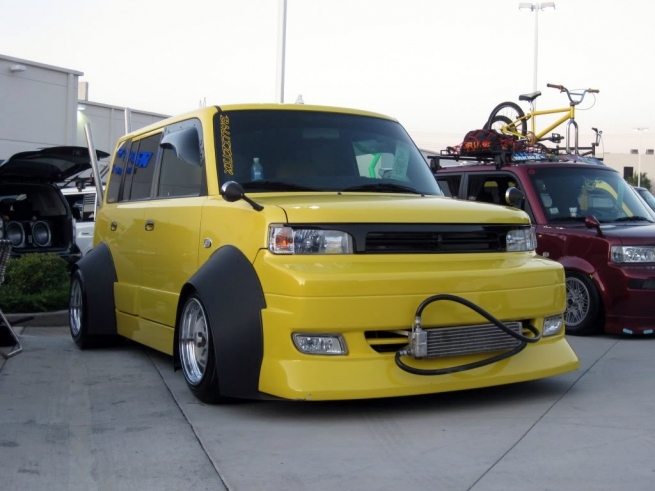 The Boso Box is a custom home made flared scion sitting (at stock height) on 15×13(!!!) -119 Ronal wheels with magnesium faces. Since no one really knows anything about these wheels it’s probably safe to say they were some sort of racing one off’s. In addition to the wheel and flare setups the box also has a crazy exhaust and a pretty accessorized interior and trunk area. That's a lot of dish! Personally the Boso Box doesn’t do anything for me, I would never drive it myself, but chances are I will never see it in person and no one is forcing me to like it or to do this to my own vehicle. While our tastes may differ myself and the owner (and all of you reading this) are still car enthusiasts all the same and we should each share somewhat of a mutal respect for each other. I do see why some people feel so strongly against it but I’m not sure its worth worrying about that much. Far worse things have been done to cars before this and far worse things will be done after. Do I want to see a bunch of cars like this on the streets here in Toronto? I think what it ultimately comes down to is different strokes for different folks. 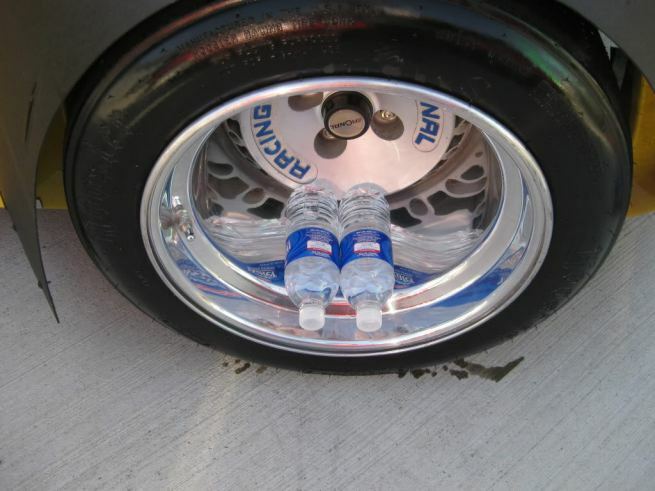 If we all modded our cars exactly the same things would be pretty boring no? If you saw this car in your hood what would you think, and what would you do? If you want to read more about the Boso box head over to OMG Pancakes. These cars always make me LOL. The style is just so radically different than anything you’ve seen before…. I can only hope it doesn’t make the leap to North America, in large waves anyhow. Um I hate the flares on the yellow one but everything else is gravy….I’m always a fan of something different.. If I knew for a FACT that I would not get pulled over at every other street. I’d so BOSO my Legacy or some other car. I like it cuz its so different and wild, but I won’t even want to try because the “MAN” will hunt me and hurt me. The yellow box is my friend James, I helped James with the design and installation of the exhaust pipes on the vehicle. He is a die hard boso man and a die hard DIY man! I am always thrilled to work with him on his box or to even see what he has new. I am always explaining to people what the inspiration is for BOSO. I always have to give credit where credit is due, and this ca gets points in my books for standing ou from the crowd and although I’d never do it to MY car, I’m likIng those exhaust pipes! Wow I think this is my most commented post in the shortest time period. Glad to see people at least respect what the man is trying to do even though they would not personally do it. And ya if we did it here the man would be out asap. I hear he got ticketed for being too low even though he is at stock height… weird! i built the shark nose on his xB…i love the style. and thought of doing it on my xb…but wnet the other direction. to each their own on opinions, but you got to give credit for doing somthing no one else !!! boso is such an interesting and crazy automotive lifestyle, and thats why its so fun. After a while the rods, street drift cars, and vws can get a bit dull, I dont see a problem introducing some new styles to our ever growing car culture. Annnnddd…..as long as you pass smog in cali..you really dont have to worry about inspection..making it the perfect place to get away with it..
LOL! James is on another site. nice! 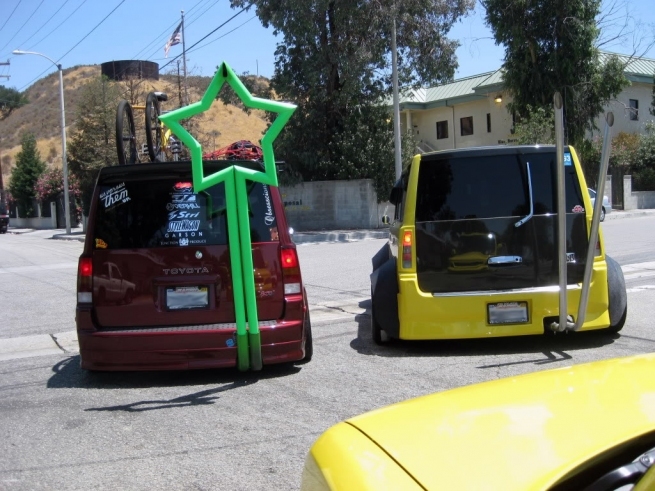 I took the pic of the boso box with the other boso box with the star exhaust. lol. i personally love the style and love that someone is willing to push, and exceed the preset boundries of the car culture. hey guys! thanks for posting up my car. its for sure a love or hate style of modding. and yes i did get pulled over in some small town in CA and they officers were dicks! the car is at stock height and a ticket was given for being too low. i was told the body kit made it too low and it wasnt safe if i got a flat tire hahaha. oddly enough i didnt get a ticket for the pipes so i suppose those are legal. You, sir, are now cool in my book. 😉 Anyone who realizes that the reactions are gonna be extreme and still can be cool about it is definitely cool, haha.